Israel Aerospace Industries is one of Israel’s biggest arms companies. Founded in 1953 as Bedek, IAI has long been at the forefront of Israel’s arms production and export. It also develops systems for commercial aircraft. In 2013, 73% of IAI’s sales revenues came from exports. IAI writes on its website of its drones’ “unsurpassed track record of over 1,200,000 operational flight hours for over 50 users on five continents”. IAI’s drones have been used in Israel’s attacks on Gaza and Lebanon to devastating effect. Palestinians are calling for camppaigners to take action against the company. 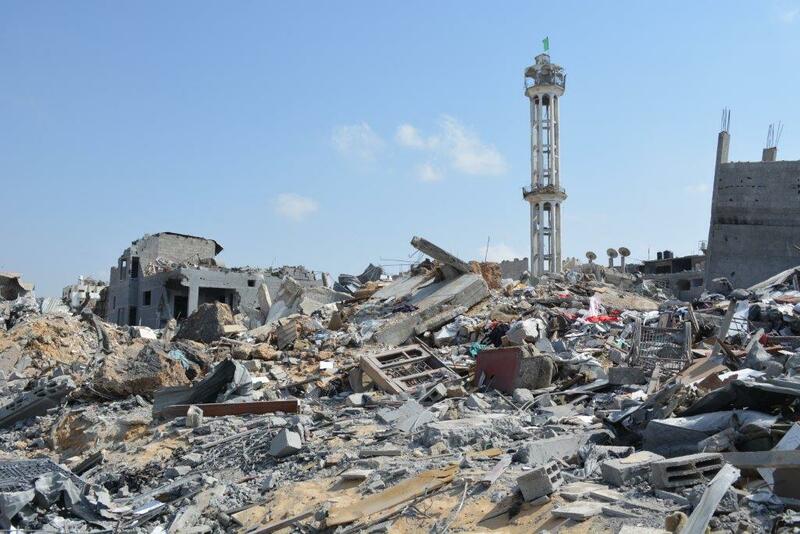 Photo above taken on the 18th August 2014 by Charlie Andreasson of the International Solidarity Movement of the destruction in Gaza City after Israel’s ‘Operation Protective Edge’ attack. The damaged minaret is all that remains of a mosque.